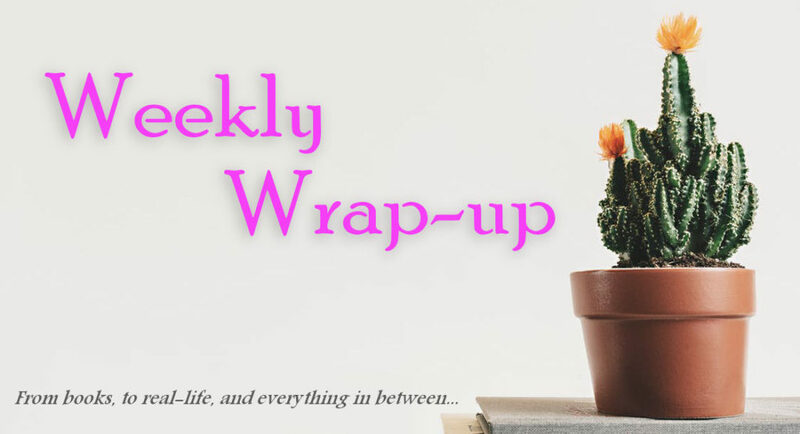 I skipped last week’s wrap-up since there was quite a bit going on. We wound up driving 3.5 hours up to look at a potential house at our new location. The woman who put the house up for rent told us that if we didn’t drive up the following day (Saturday) to look at it, she was going to give it to the next person interested. This was after she accepted our application, took money for the credit check and said the house was ours. So, yeah. Last Saturday was spent in the car driving, only to find out that the house was way too small for us. I mean, there was no where to put my bookshelves… and I only have 3! By the time we got home on Saturday night, I was exhausted and not up to typing a weekly wrap-up post. This week was just as busy and just as upsetting. There was a house that we put an application in for last month. Even though the house isn’t available until next week, they were going to go through applications a week prior to even allowing people to view the house. However, the pictures looked good, the sq footage was promising, and we felt like this was our place. Well, the beginning of the week started off great with the realtor calling me asking me small questions like if I was willing to pay “x” for a pet deposit, and what lease length was I willing to do? We were in the final stages of getting the house and they wanted to run our credit check. I was beyond excited because I know our credit is good and I felt like we finally FINALLY had a place. Until, that is, on Wednesday afternoon as I was running out the door to start my shift at Comic-Con and got the call that they decided to go with the other person interested in the house. No one could give me a reason why we didn’t get the house, just that they went with the other person. The Mister and I think it’s because we have a cat and a dog, even though the listing said they allowed pets. At least Comic-Con was fun. Our shift got a rough start when the scheduling computer said we didn’t actually had a shift to volunteer, and that the next available shift was either five hours later in the night or the following day. The shifts are three hours long and we had left our dog home alone without a sitter figuring we’d work our 3 hours and then head home. So, that wasn’t going to work for us. Finally the lady took pity on us, looked on the main computer and pulled up our schedule and was able to get us in, but while we sat there trying to come up with a solution, our shift started and so we were randomly placed with another group. Which wasn’t so bad since we were in charge of stuffing the bags with the event books and lanyards. 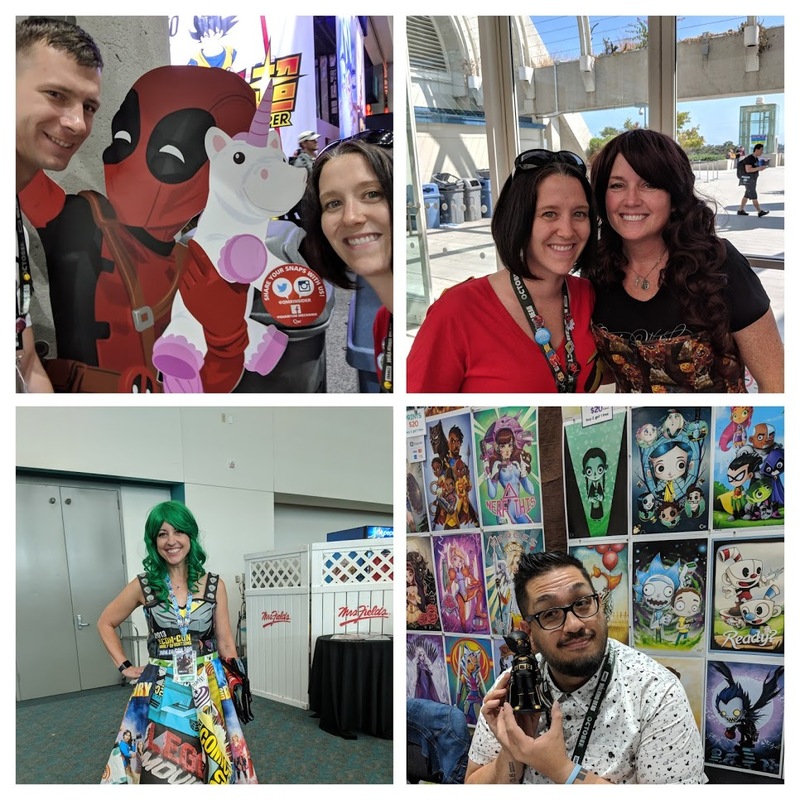 Then the following day we got to go back to Comic-Con and attend the convention. The Mister was able to get his two exclusive statues that he really wanted, we got a bunch of signed art prints, and I got to meet Sherrilyn Kenyon! It was actually really cool because as we were walking around the artist section of the convention floor we came across the artist behind one of the statues he bought. So we were able to get the statue signed. 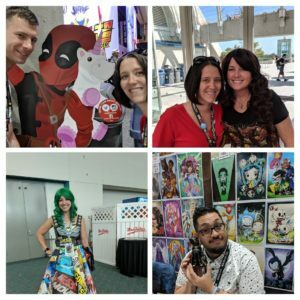 The one photo is of a woman who made a dress out of Comic-Con bags! It was insane and I had to get a picture of her. I hope that everyone had a wonderful Independence day last week. We pretty much stayed home and laid low. Our pup goes nuts barking at fireworks, and since they were throwing them off a block away from our house, we decided to try our best to tire him out. Which mean runs (I’m not a runner), and taking him to the dog park (where no one was there with their dog). Ha! It apparently worked though because we were able to sit on our couch and watch the fireworks out our front window while holding the pup and all he pretty much did was grumble and throw off a few barks. Id’ consider that a success. We are currently going through a bit of a heatwave here in San Diego. It’s been in the 100’s for the last couple of days. This morning I woke up to it already being 80, and yet the weather channel still says the high with only be 92… yeah right! Fun news! The Mister and I got our volunteer schedule from Comic Con! We will be volunteering on Preview Night which means that we get to choose a day pass for any day of the convention to go back and attend. Usually they’ve only allowed us to volunteer during CC hours, which means we volunteer during the convention and then after our 3 hour shift we are allowed to go in and explore for the day. Getting to work before the convention is in full swing allows us to get a full day badge and I can’t wait! It will more than likely be our last CC since we are moving a few hours away next month. I hope everyone is enjoying their summer. This week was a bit all over the place for me. I wound up getting sick again later in the week. Which really sucked. Especially since later that night I was attending a Mamma Mia! play with a few friends. Thankfully, I rallied and was able to go and have been feeling good since. Cross your fingers for me. Yesterday the Mister and I took a drive up north to go to a craft store. While we were out there, I wanted to check out a local nursery… you know, just to see what they had. Big mistake. Or was it? 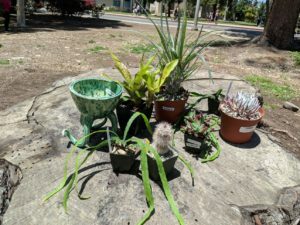 We wound up walking out with five new plants. 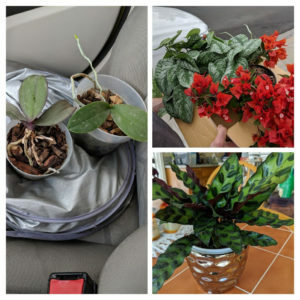 We then proceeded to discus how we were going to get all these plants to our new place, which is a few hours away, while driving back home. Oh, and I also joined a book club with some people on Instagram. I just managed to catch a IG story from a book blogger I follow who was asking if anyone would be interested in joining a romance book club. Um… hello! Yes, please! I’ve been wanting to join a romance book club, but have never been able to find one. I’m back home, and boy am I exhausted. Am I the only one who feels like they need a vacation after their vacation? Since we live across the country from our families, we only fly home every couple of years or so. Last week we flew home for my niece’s high school graduation. We pretty much hit the ground running. We had something going on every single day we were there. On our first day there, we went to a local baseball game and watched their Friday night fireworks. Then Saturday we went to a local racetrack (something my father loves to do when we are in town). Sunday was my niece’s graduation topped off with a Paramore concert. Monday was a relaxing day at the spa with my best friend. And those are just the main events that happened. That doesn’t count all the trips to the stores, dying my niece’s hair, having people over, and just trying to fit everything in within a week span. It was great getting to see my family and watching my niece graduate, but between you and me… I’m so glad to be home. Since I’ve been gone, I haven’t really been doing much reading. I started reading Getting Schooled on the trip out to NY but once we landed and I had no time to read, I completely detached from the story. So I need to pick that one up and restart it. While in NY my best friend gave me a signed copy of Total Cat Mojo and I started reading that on our trip home. Needless to say, I started two books, and didn’t finish either of them. I also didn’t take any bookish photos for Instagram while I was gone, nor did I get a chance to post any of the photos I took prior to leaving. I wasn’t joking when I said that there was no time. As it was, the little bits I was sharing on my IG stories were just snippets of what was going on while I was there. Although, I hate it when people play on their phones while out and about, so I kept my updates to a minimum. I’ve been kind of slacking on reading and blogging this week. There’s a lot going on over here and I’ve been a bit busy trying to get ready for it all. I might be quiet for the next couple of weeks since we will be surprising my niece for her graduation. 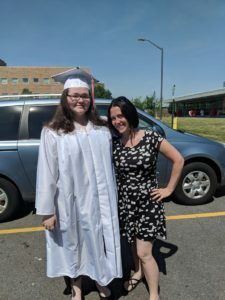 Since we live across the county, we can’t always be there for everything and since we are getting ready for another move, she is under the impression that we can’t fly out to see her walk across the stage… as if we’d miss her high school graduation. I will still have posts scheduled to go out, but I won’t be fully online to respond to everyone until we get back home. Now that my tailbone is all healed, I started going back to the gym with the Mister this week. I don’t know what I was thinking because I hurt all over! Apparently he started a new intense high-weight workout for the next few weeks and I just so happened to pop back in right as he was starting it. Needless to say, I’ve been walking around like a mummy. I’m all stiff-legged and moaning. It’s going to be a while until I get back into the groove of things. Yesterday was the cacti and succulent society summer show. I’ve enjoyed going to these shows because there are so many unique plants there that I’ve never seen anywhere else. Plus, they have a contest of the best plants. So, you get the chance to look at some really magnificent cacti/succulents. However, because we wound up buying so many plants, we didn’t end up walking the show afterwards to check out the prize winners. Which I’m okay with because my plant obsession is going to new heights. I don’t need to find more plants to add to my wish list. We got a lot of interesting plants that I’ve never seen before, as well as a kickass octopus pot from Tentacle Arts who was there for the show. We went a bit overboard in our purchases but since this is the last society show before we move out of the area, we sort of just bought everything that caught our eye. I’m just hoping I can keep everything alive, especially when we move to the desert in a couple of months. While the Mister bought cacti which will love being in the Mojave desert, my jungle plants will require a lot more attention and love if they are to survive the dry, hot climate out there. No regrets though because they are super cool! This week seems like it just flew right on by. It’s still been cloudy here, so I haven’t been able to do much on Instagram. However, the Mister and I have been checking out local nurseries in the area. He’s been on the lookout for a specific colored bougainvillea… which he was able to find yesterday! It was the only one they had. Today will be spent checking out other nurseries for a color that will compliment it since he wanted two different colors for the area he has planned. Me on the other hand, I just love going and checking out the houseplant section. I may have obtained five more plants since the last Weekly Wrap-up. It just seems like every time I walk into a nursery, they have one of the hard-to-find plants that I’ve been searching for online. Plus, two of the plants are from a neighbor who gave me her two orchids to nurse back to health. Which I think will be a fun project as well as interesting to see what their flowers will look like. Double the reading, double the fun! Whoops! I know, I know. I missed last week’s round-up. With the Mister away on business for a week and a half, I sort of lost track of time and my schedule got all mixed up. I also had quite a bit going on which caused me to forget to schedule my posts on time. I was also pretty inactive on Instagram except for sharing stories of what I was up to. I know I talked about plants last week, but I am even more excited about the plants I got yesterday. We went to our local nursery because The Mister wanted a bougainvillea. 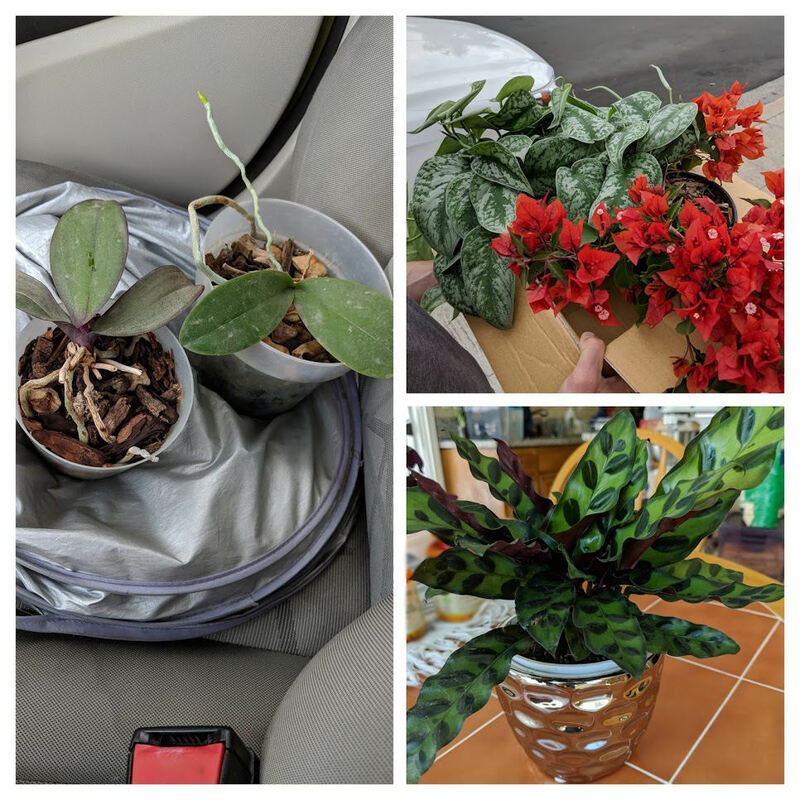 We wound up not finding the one he wanted, but I found these two awesome plants! 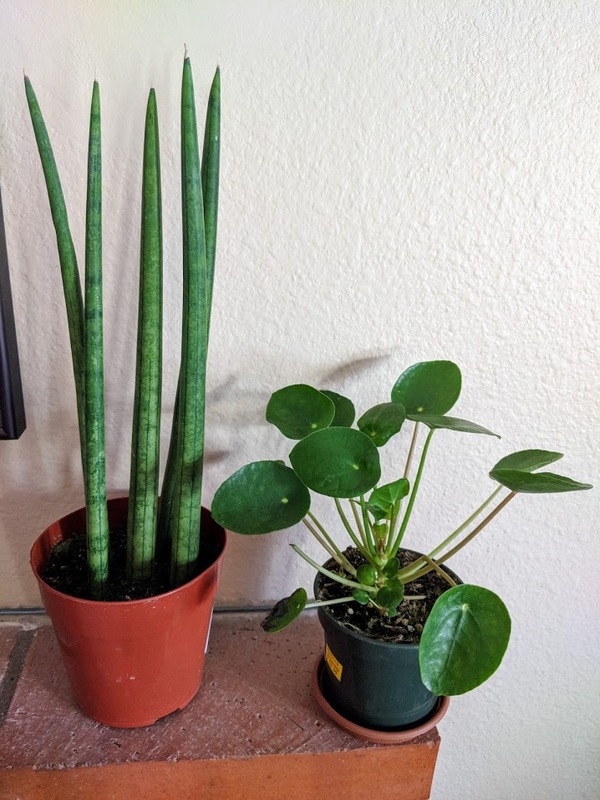 The one of the left is a Cylindrical Snake Plant aka African Spear and the one on the right is a Pilea Peperomioides aka Chinese Money Plant. The Pilea is a plant that took me forever to find online last year for a friend who really wanted one. I wound up dropping $30 on a tiny 2″ pot to be shipped to me. So, imagine my surprise when I rounded the corner and there were a whole bunch of these plants for sale! There was no way I was walking out of the store without one.